As the season changes, so does the appearance of the forest floor. New growth bursts forth while moss covers the dying roots of once huge trees. Welcome to the 25th issue of Whispers, the newsletter of the Dereila Nature Inn - your cyber nature centre. Thank-you once again for supporting this project and subscribing to our newsletter. This month we have some new photos for you to enjoy, a bit of trivia and several new features to tell you about. We hope you like what you find! In the early days of the textile industry, when massive looms were employed, which plant was found to be useful? 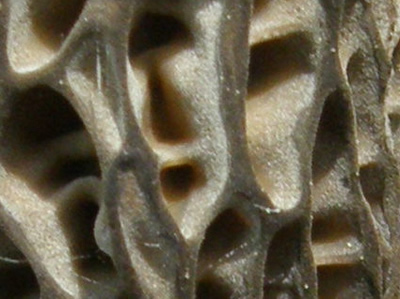 Here's a close-up of a small section of one of nature's unique creations. Do you know which one it is? 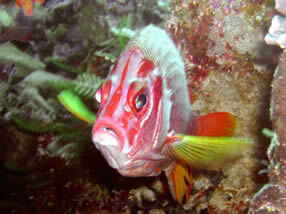 This month we have added pages on mammals, a special place and a guide to marine life. Click on the images below to visit the pages. Three mammals have been added to this series. Take a virtual tour of this strange place of water and curious rock formations in the latest addition in our series of special places. Discover a variety of astounding marine species in this pictorial guide. amazing images. 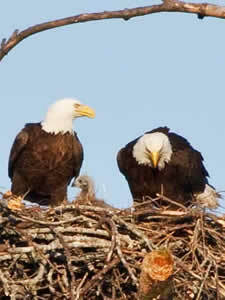 Judy's pictures are of Bald Eagles with their nest and young. We are also honoured to include two more photographs from the water world of Dr. R Walker. 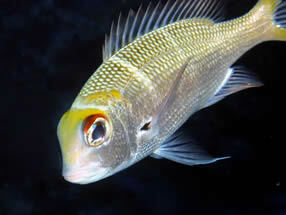 These fascinating tropical fish come from the islands of Palau, near the Philippines. Many thanks to Judy and Rob for sending in these wonderful photographs! This month we wander down to the beach. 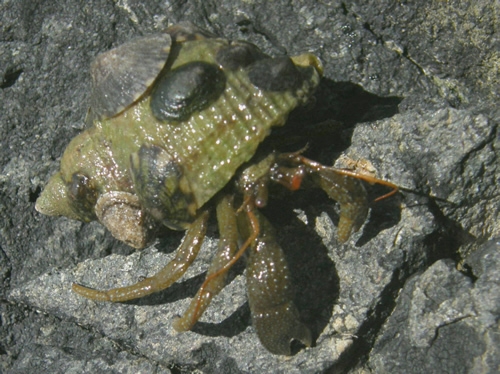 The Hermit Crab is a strange seashore creature as it likes to live in snail shells. chauffeured around on the Hermit Crab's chosen shell. 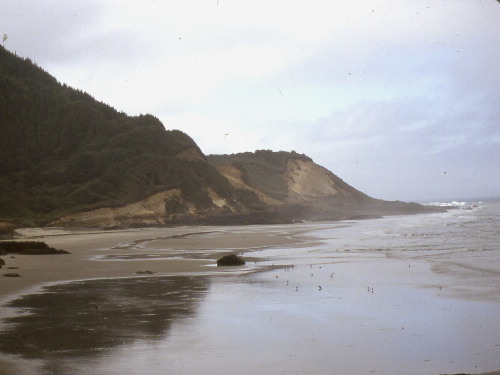 The wild and amazing coast of Oregon is a nature-lover's paradise. exploring rocky outcrops and doing a spot of birding. Here's is this month's image that is waiting for a funny caption. What do you think these two ants are saying? To get you started, we've given you a couple of suggestions. Number one: "Hey! Have you heard the latest?" Number two: "Do you come here very often?" "Im not speaking to you."" If you have any suggestions for additional funny captions to these photographs, please, send us an e-mail! We'd love to hear from you and add your caption to our collection. In this section we examine the meanings of the scientific names given to organisms. This is Wild Garlic, Allium vineale. Allium simply means onion or garlic. The vineale part of the name doesn't mean that it is a vine, but rather the plant's orginial association with growing in vineyards. 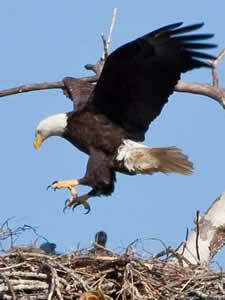 It's native to Europe but has been introduced to North America. Allium vineale is sometimes also called Wild Onion or Crow Garlic but when using its scientific name, everyone knows exactly which plant is being referred to. A teacher takes her young children to the local library for story telling and to pick a book that they would like. One little boy picks up a book and takes it to the teacher. It is called Guide for all Mothers. The teacher asks, "Is it for your mother?" "No, it's for me," the boy replies. "I started watching and photographing moths last week. I'm a new moth-er." This moth just seems to be saying, "Boy, the things we have to put up with these days!" Keep an eye out for new-borns as they become a little more bolder and start to explore their world. If you can help with any of these image, please send us an e-mail. Many thanks! Our next issue will be in your inbox during the first week of July. Until then we hope you'll enjoy many wonderful moments in nature. 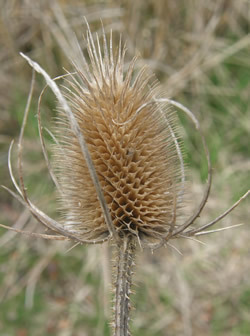 The Fuller's Teasel was formerly widely used in textile processing, providing a natural comb for cleaning, aligning and raising the nap on fabrics, particularly wool. 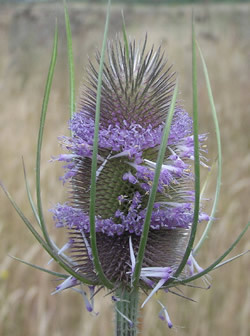 The dried flower heads were attached to spindles, wheels, or cylinders, sometimes called teasel frames. These pictures show the flowers and the dried seed head. 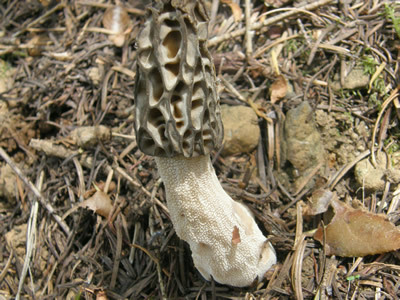 It's a section of the fungus Fire Morel, Morchella elata. Were you close? Find out more about the amazing world of fungi by visiting our Fungi At-A-Glance gallery. We thought the name Whispers well-represented the things we love so much in natural world around us: the sounds and changes in nature carried by the wind; the subtle passing of the seasons; the calming serenity of a wildflower garden and the gentle quietness of the forest. Next time you're in a special place in nature, listen to the whispers. Until next time, best wishes from your friends at the Dereila Nature Inn - the Cyber Nature Centre for Nature Lovers.